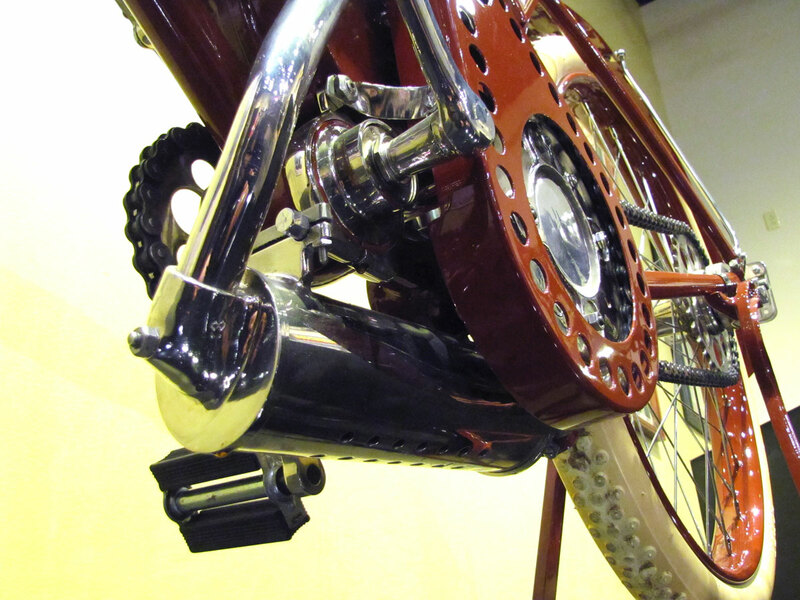 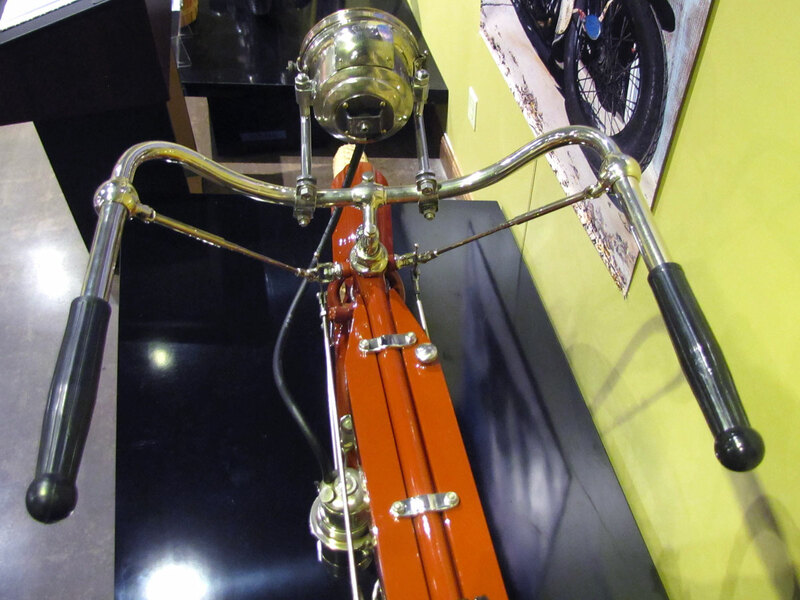 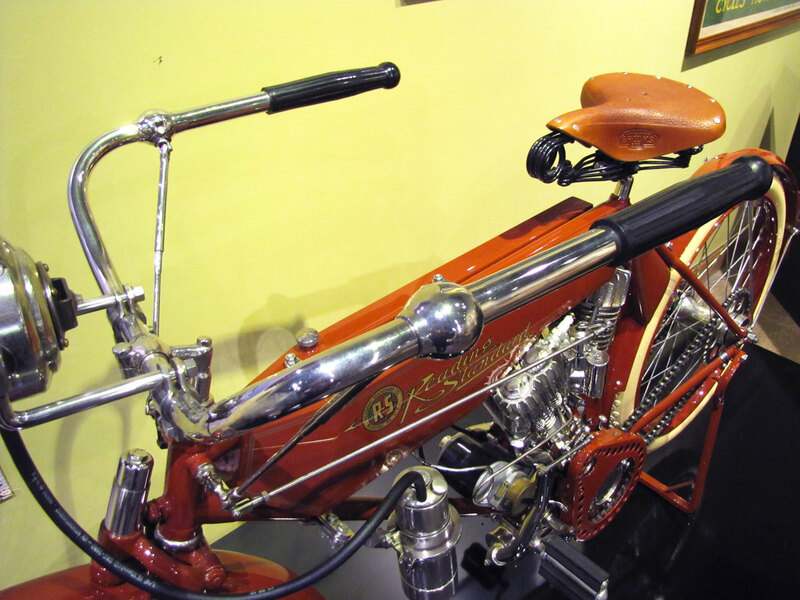 Reading Standard was formed in Reading, Pennsylvania, and first made motorcycles in 1903 using standard available cycle parts and a Thor-sourced engine similar to Indian’s single. 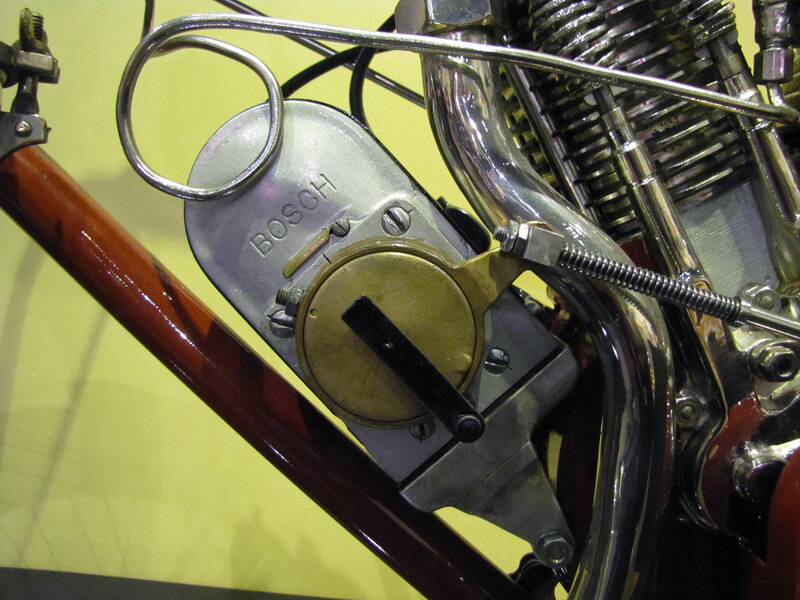 In this era there were dozens of motorcycle “assemblers” that used off the shelf components, created a paint scheme, installed their own headstock badge and transfers. 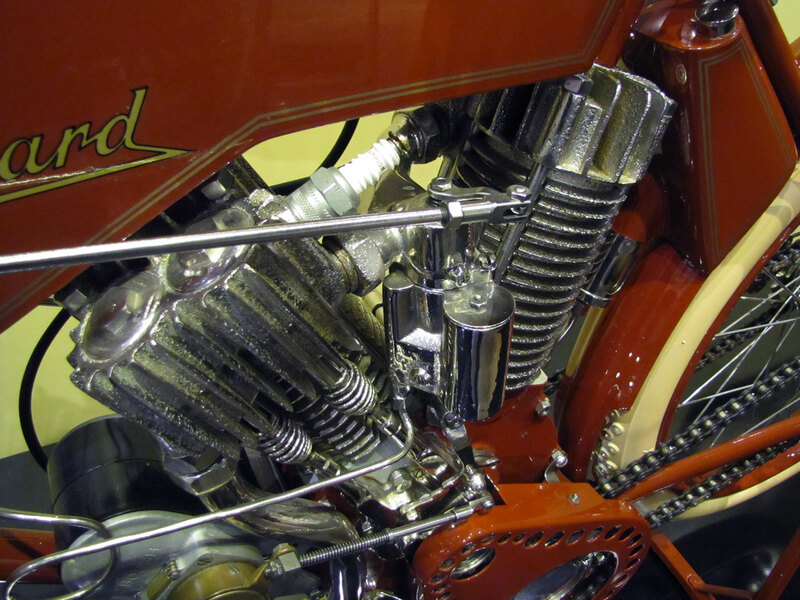 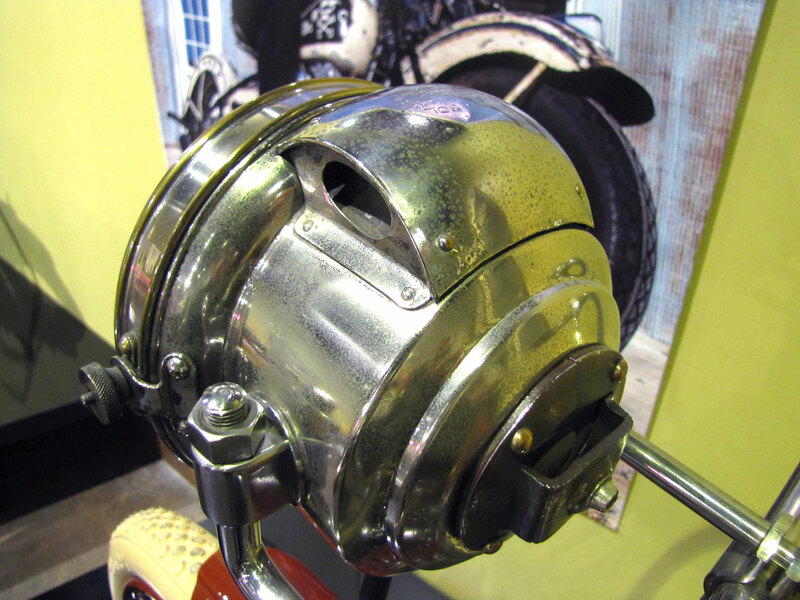 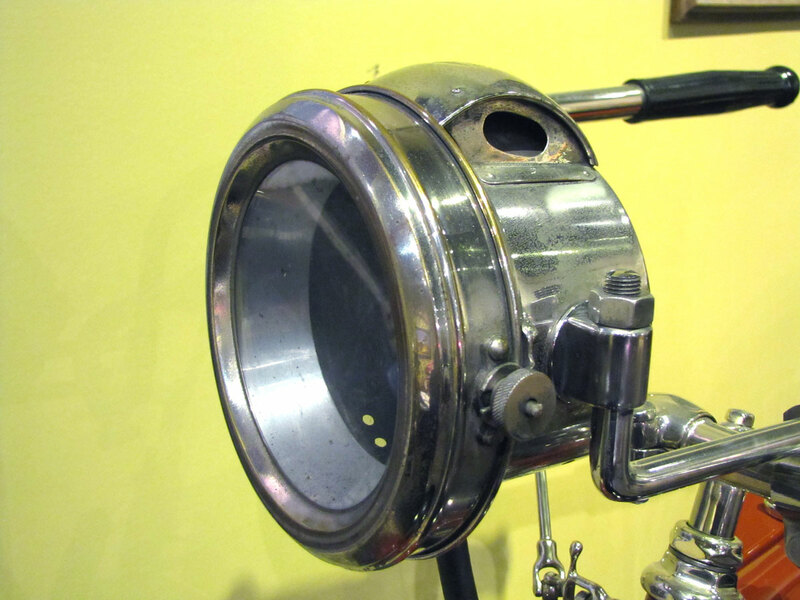 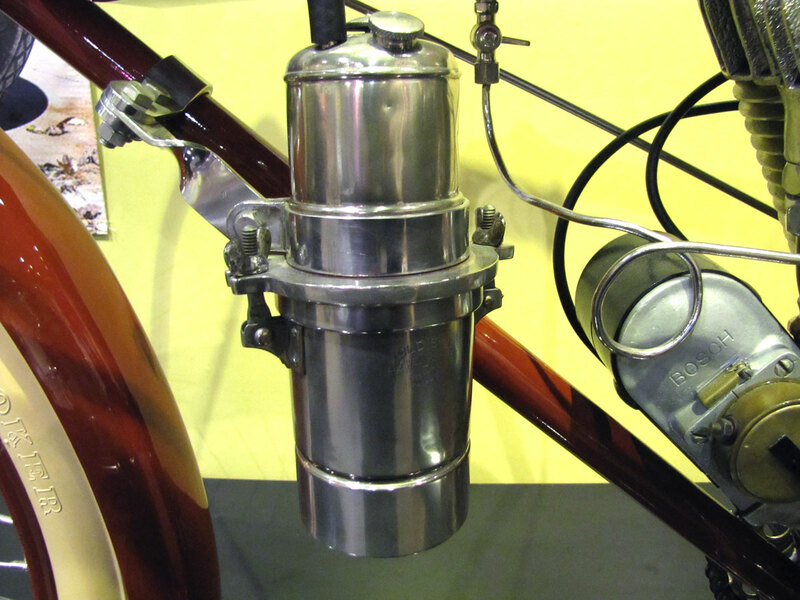 But by 1906, Reading Standard had developed its own “flathead” or side-valve engine, considered a first in American motorcycle design; most makers still employed inlet-over-exhaust designs. 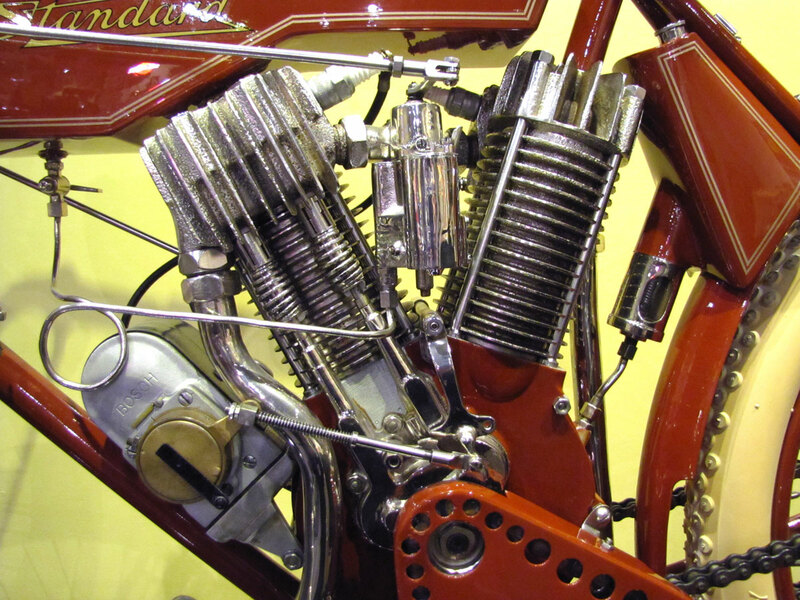 Further advanced, R/S offered a V-twin like this one in 1908 on pace with Harley-Davidson and Indian Motocycle. 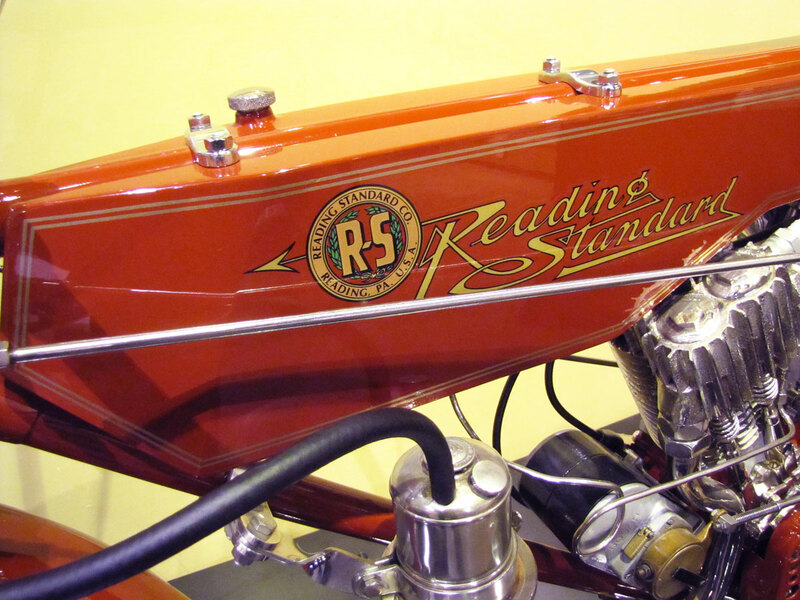 For a period of time, Reading Standard used competition or other challenges to prove the brand. 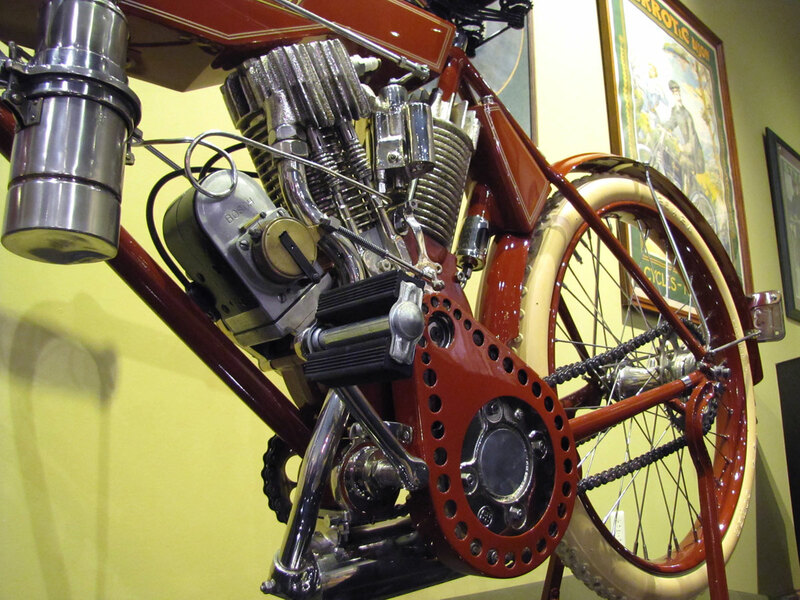 In 1907 engineer Charles Gustafson managed an effort of three riders that rode to the top of Pikes Peak, a feat unchallenged for five years. 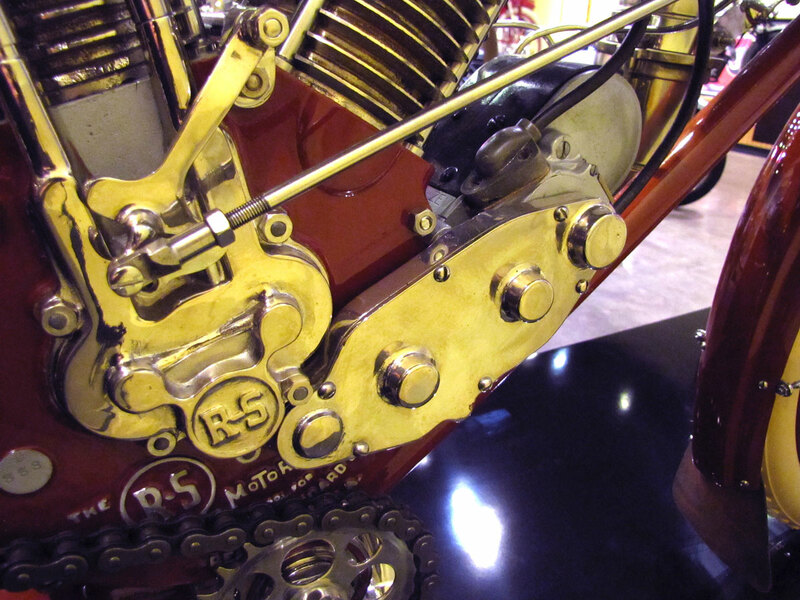 Later, Reading Standard won a 1000 mile endurance race. 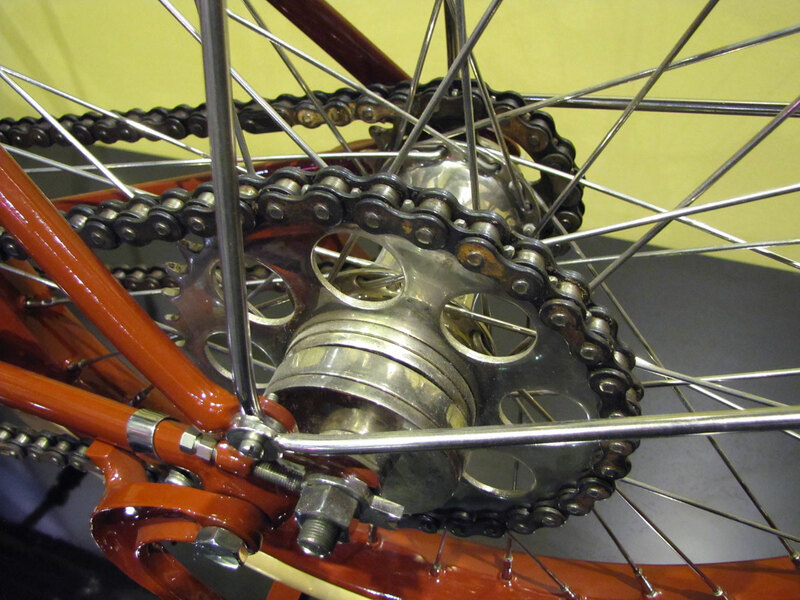 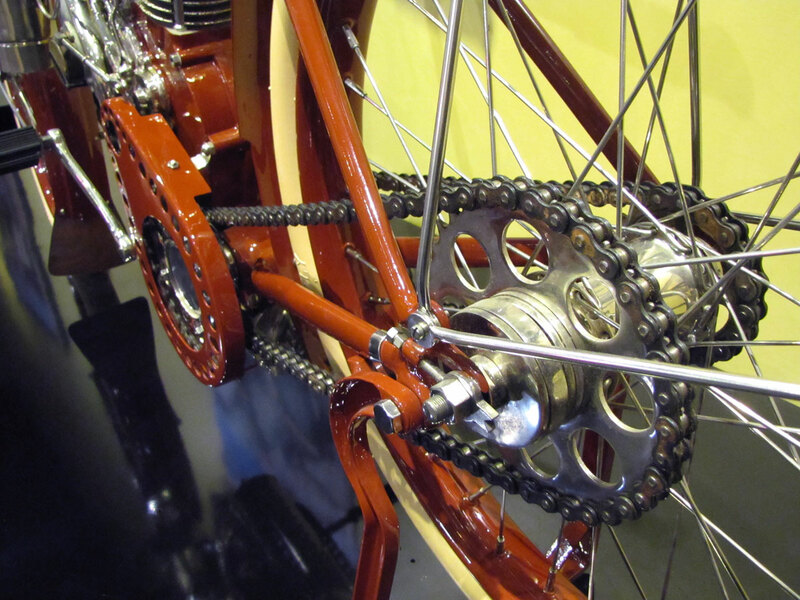 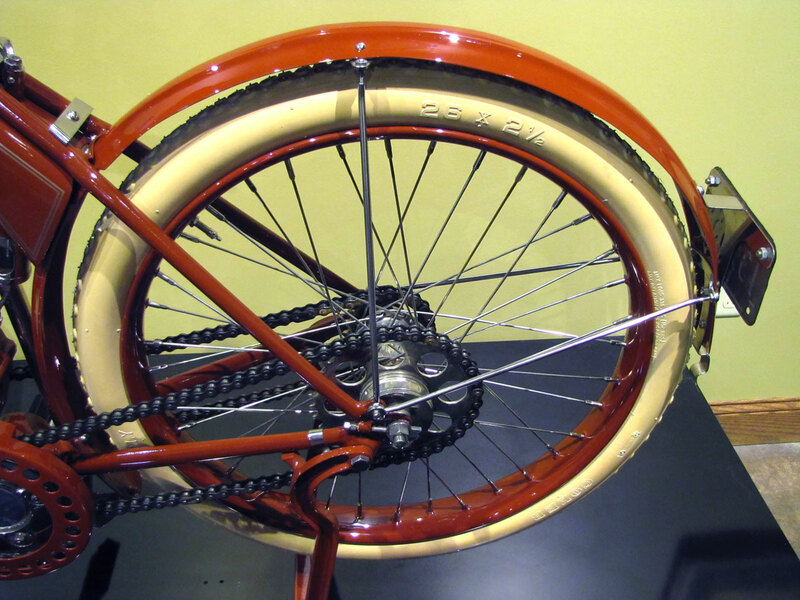 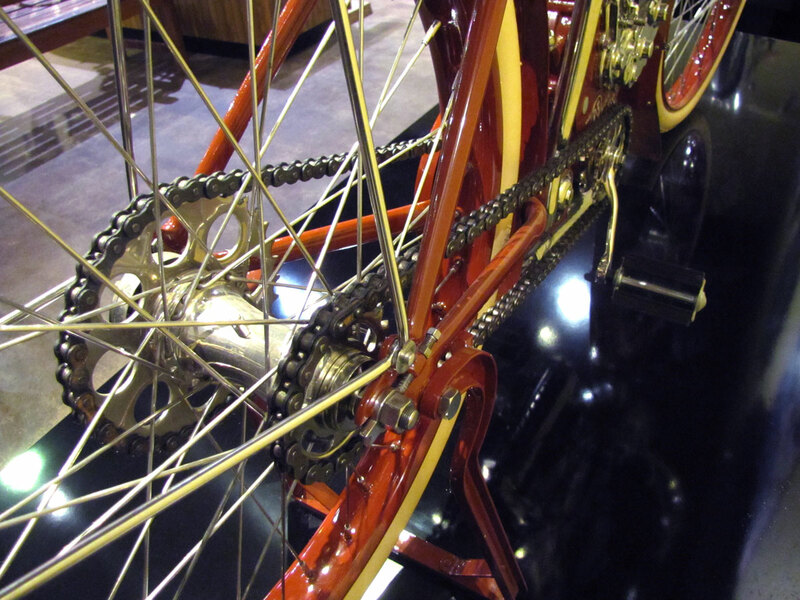 By 1913, Reading Standard offered four models in total, some retaining belt drive for price competition, most now with chain drive. 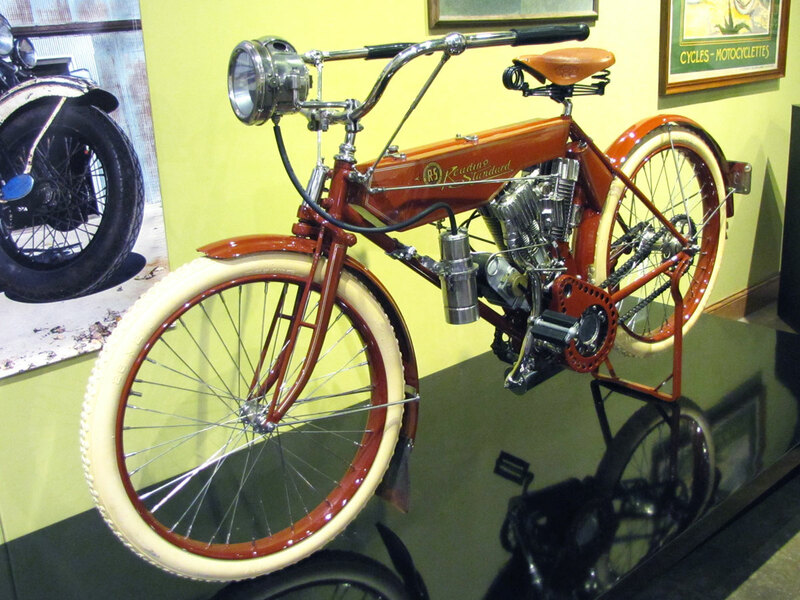 Reading Standard had lost the skills of engineer Gustafson to Indian Motocycle in about 1909. 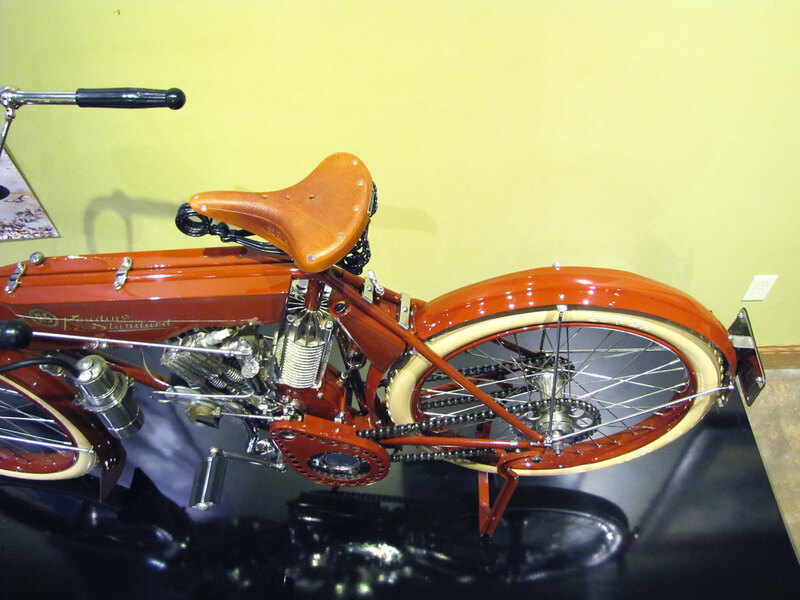 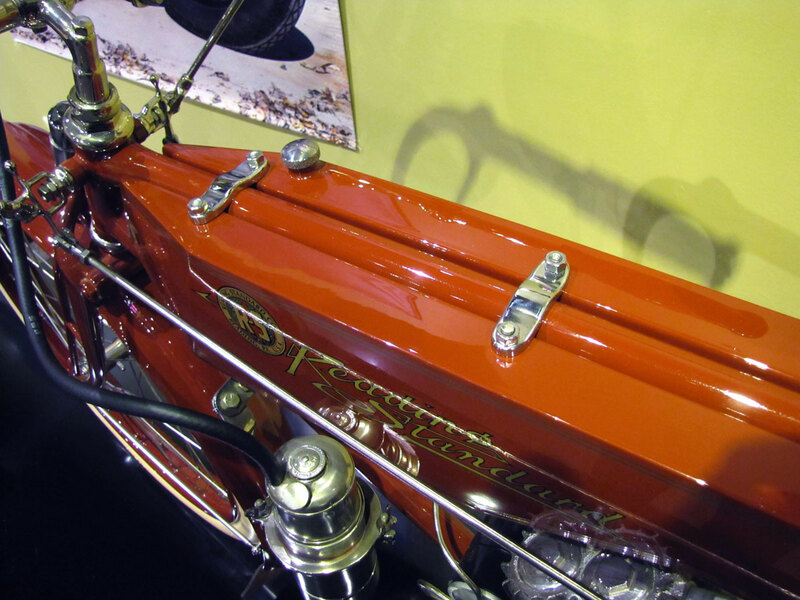 Facing financial challenges and strong competition from Harley-Davidson and Indian, Reading Standard sold out to Cleveland Motorcycle Company in 1922. 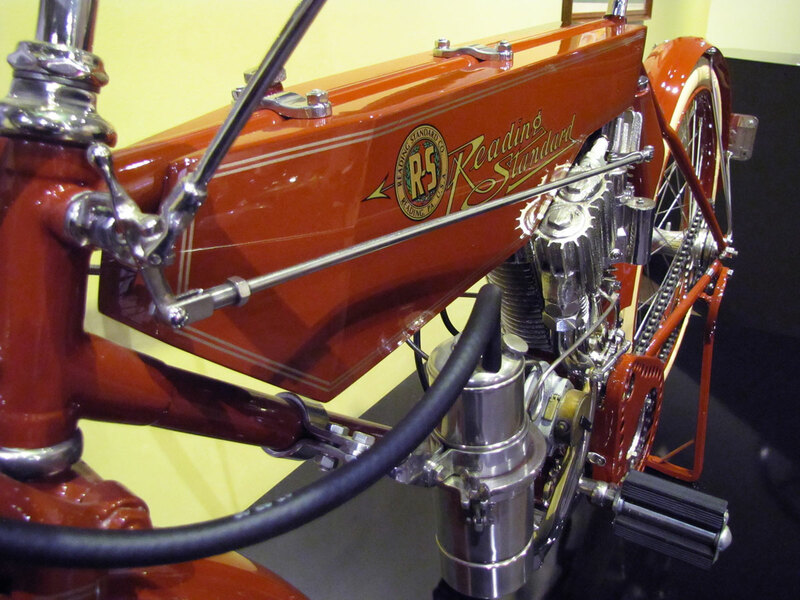 The base Reading Standard model served as a cheap offering for the Cleveland model line. 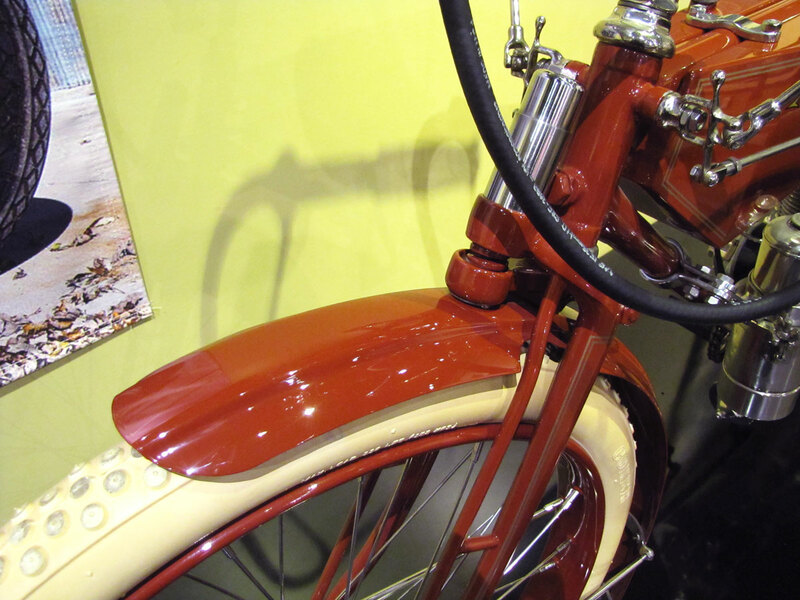 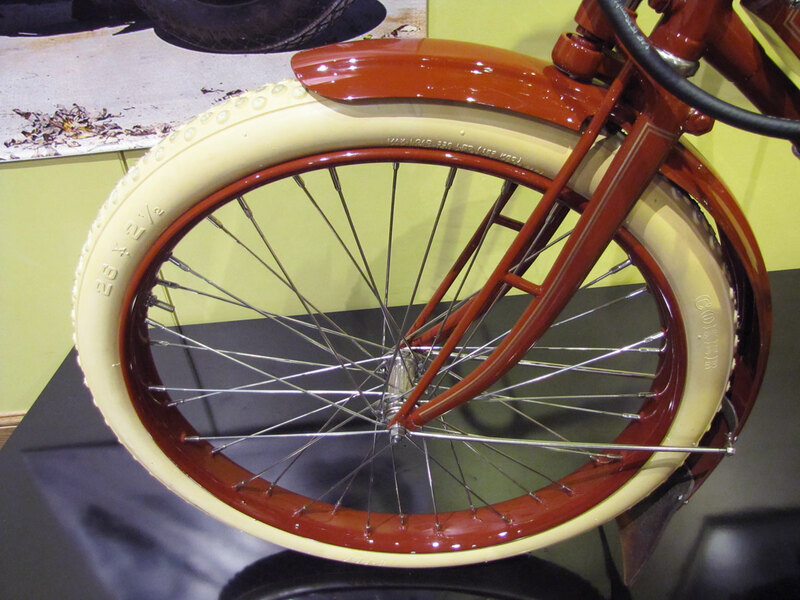 But Cleveland, largely focused on expensive sophisticated machines lost its market and went up for sale in 1923, ending production of both brands. 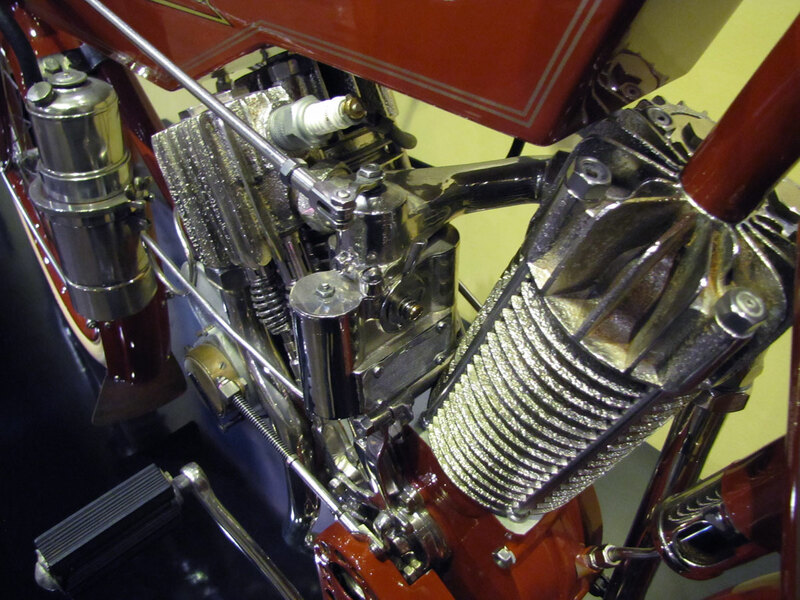 Early on, Reading Standard used Thor-supplied engines as did many other makers. 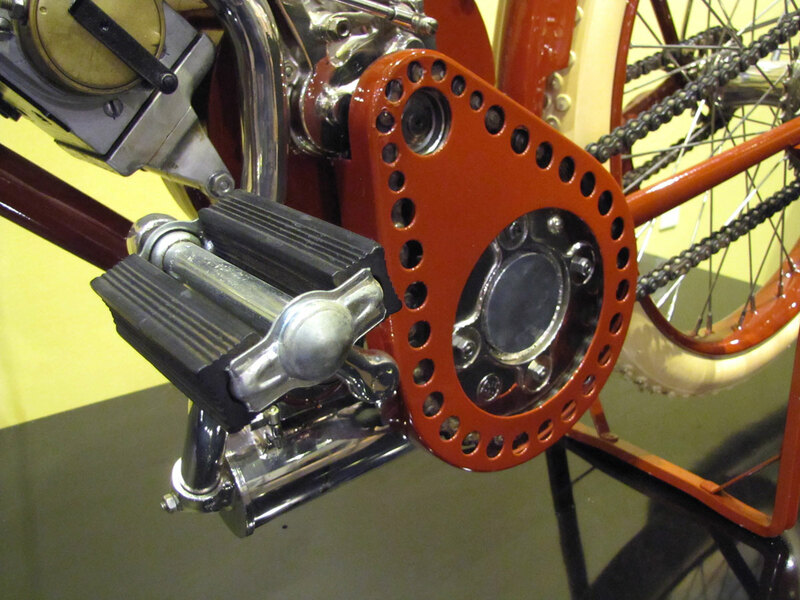 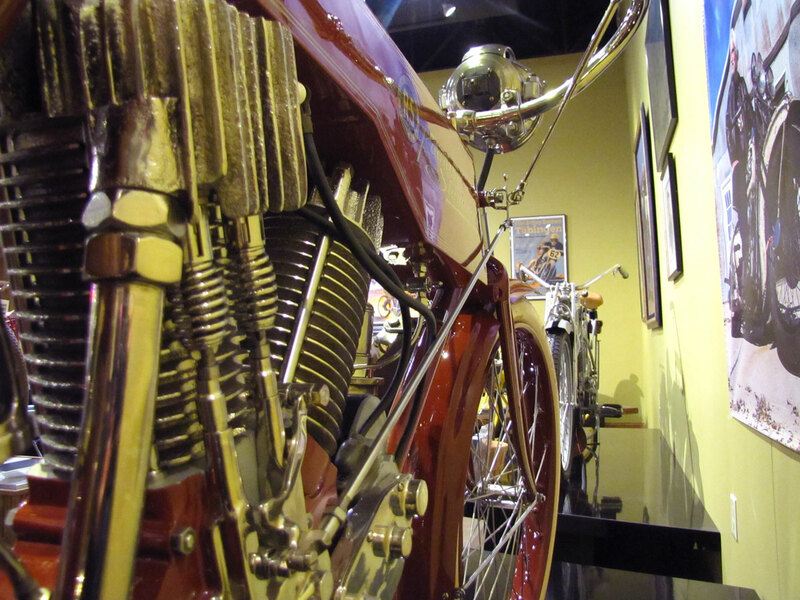 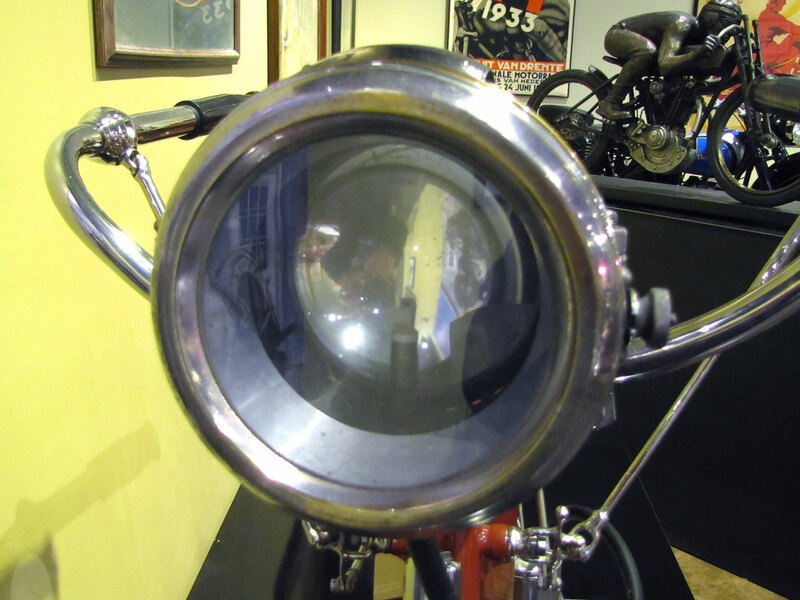 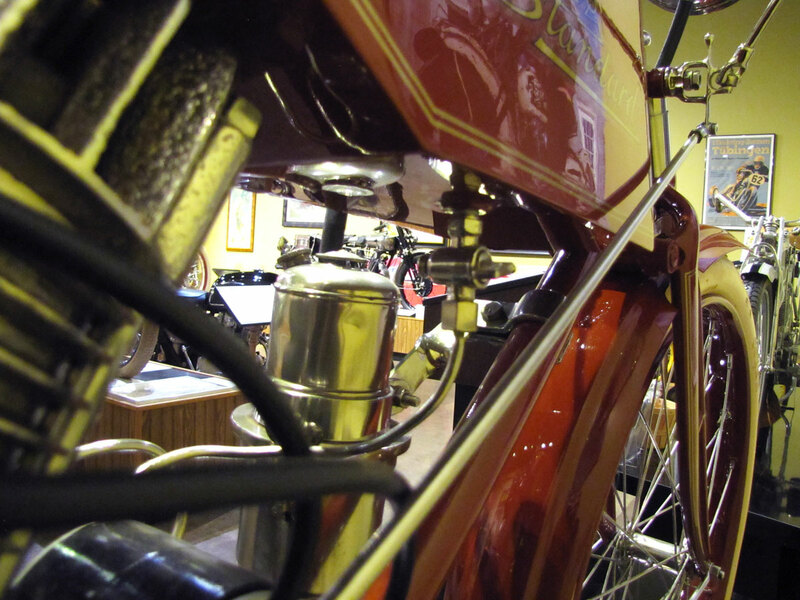 It’s interesting to compare early American motorcycles and engines at the National Motorcycle Museum. 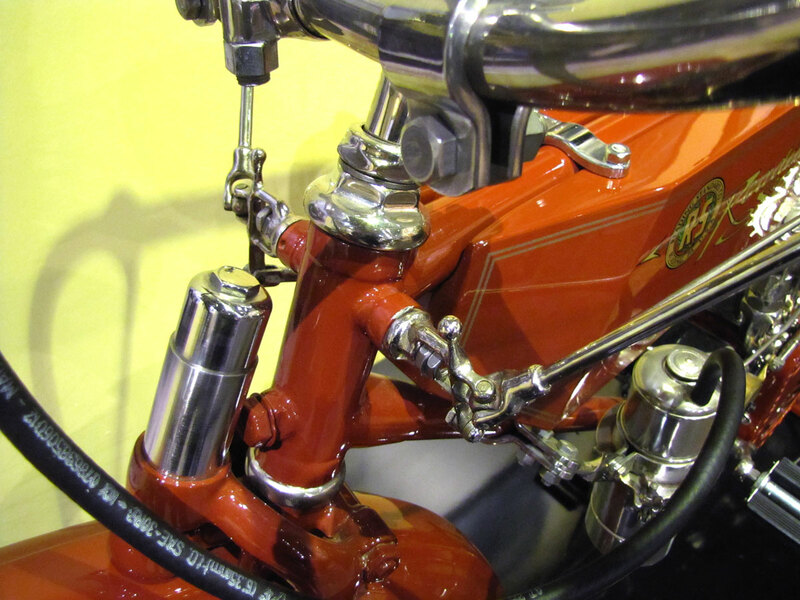 There you can see the various approaches to suspension, fuel and oil tanks, final drive, controls and lighting and on the Motor Wall, engines. 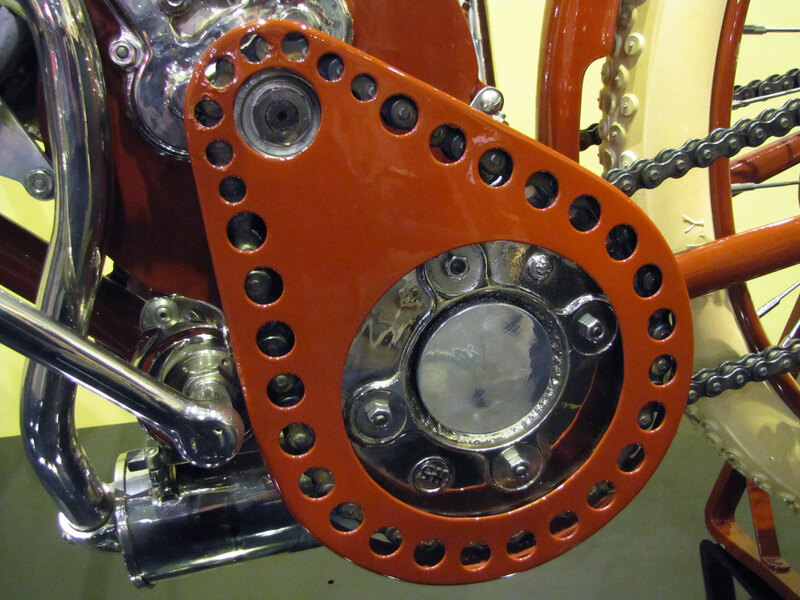 There are a couple of dozen machines that offer these details and some will be part of the Early American Transportation Innovation exhibit currently being installed. 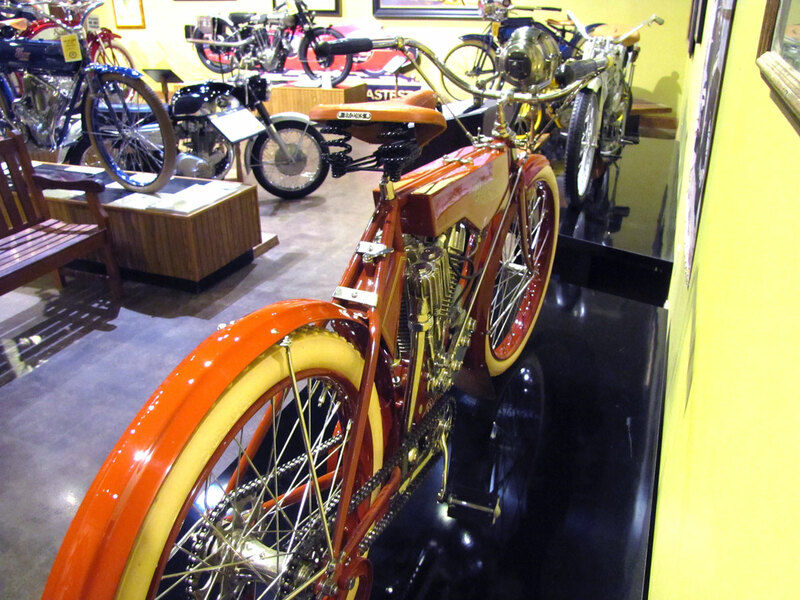 The National Motorcycle Museum also has on display other earlier Ariel Square Fours plus a rare BSA Y-13, a Sunbeam, Brough Superiors and many Vincents for comparison of these fine British touring motorcycles. 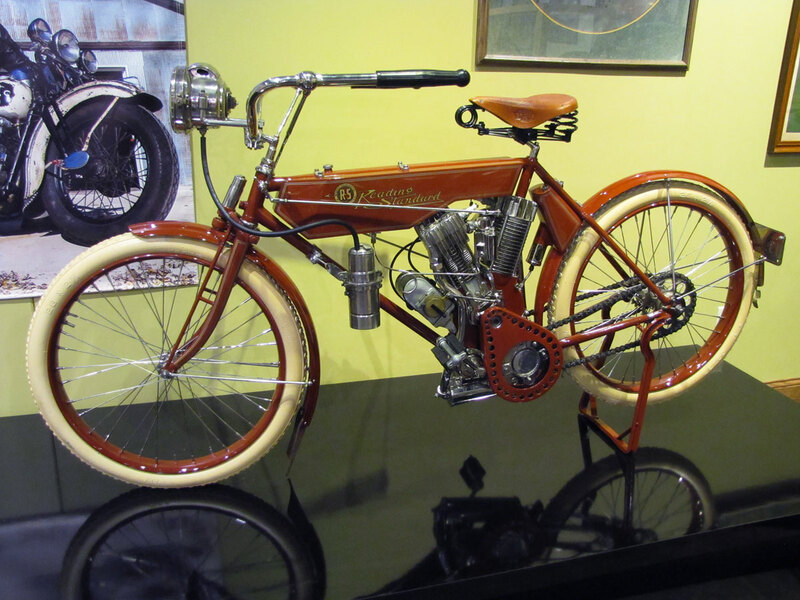 A beautiful early motorcycle. 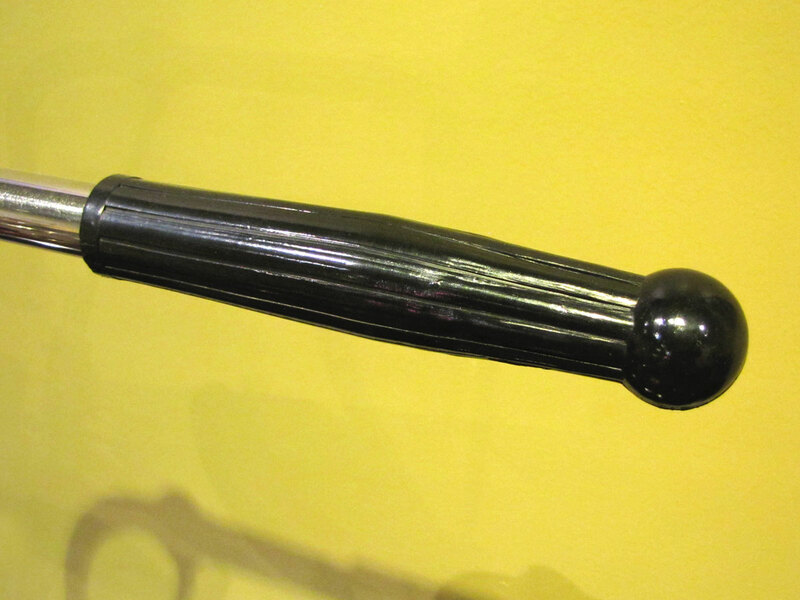 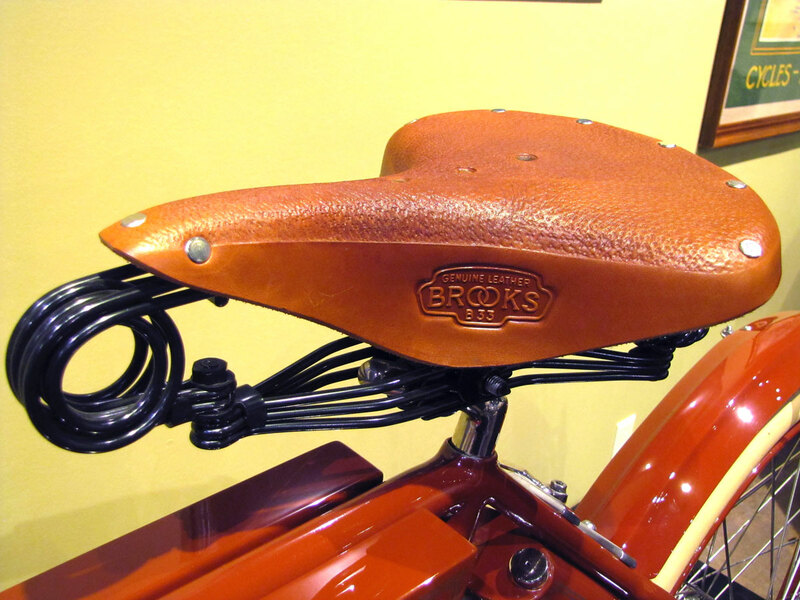 Does anyone make a reproduction seat with support stem like the one shown on this bike? 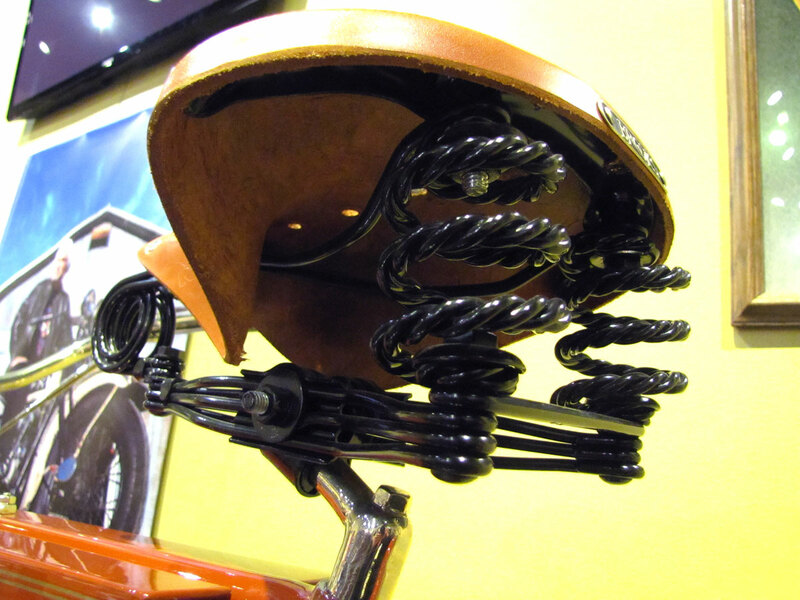 Looks pretty comfortable. 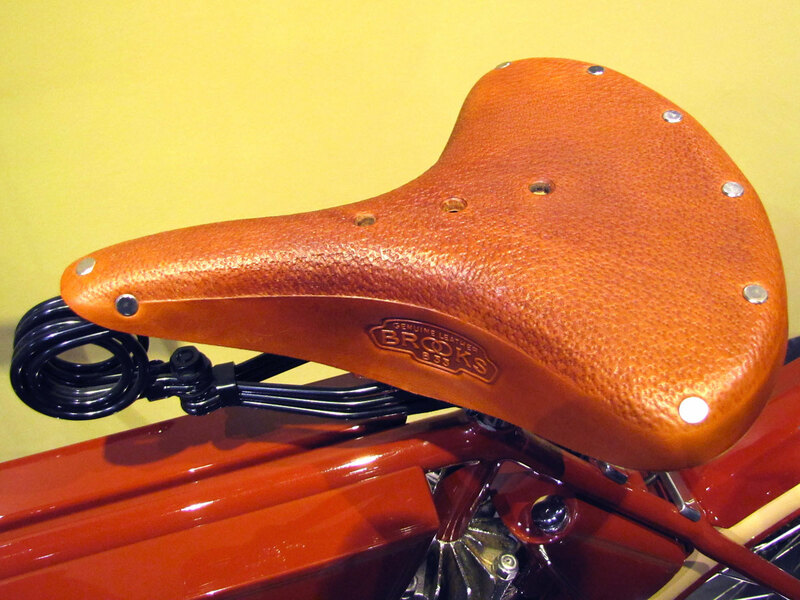 It’s likely that an AMCA member/vendor has a similar replica seat, possibly Yellow Spear Restorations, in Wisconsin. 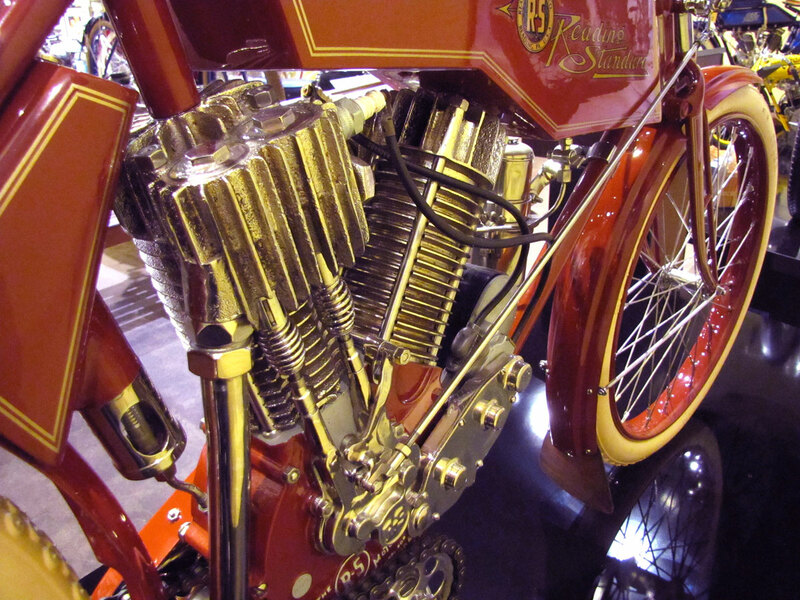 If you are not already an AMCA member, you can join and check out ads in the magazine. 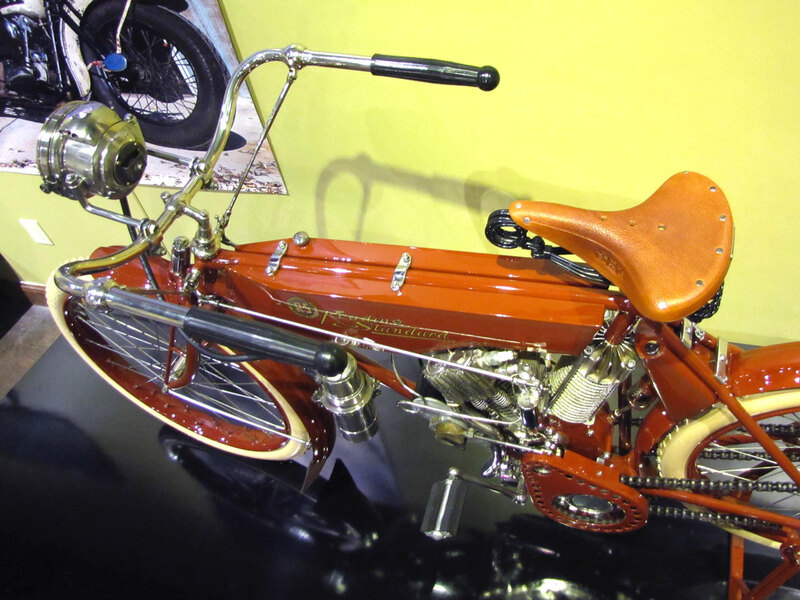 If you live near one of their 40+ meets, you might attend and ask around, or ask someone showing a similar bike at one of their meets.